How to check your Mutual Funds - Aadhaar Linking Status online? 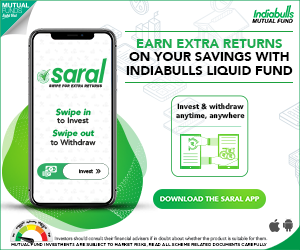 You are here: Home / Mutual Funds / How to check Mutual Funds – Aadhaar Linking Status online? As per the recent amendments to Prevention of Money Laundering Act (PMLA) Rules, 2017, Financial Institutions like Mutual Funds are mandated to obtain Aadhaar Number from their customers and link the same to the respective accounts / Folios. The last date to link Aadhaar to Mutual funds is 31-March-2018 (as of now). I am sure most of the mutual fund investors might have already submitted/provided their Aadhaar numbers to RTAs (like CAMS/Karvy/Franklin) (or) to the respective Fund houses. I have also linked my Aadhaar to Mutual fund folios that I have invested in and have received the below confirmation email about the ‘Mutual Fund – Aadhaar Linking Status’ from one the RTAs i.e., CAMS. I am sure, you might have also received such ’email authentication’ from your RTAs. However, even after linking Aadhaar to Mutual Fund folios, you may keep getting e-mail or SMS requests from the respective AMCs (Fund houses) or RTAs about Aadhaar linking, irrespective of whether you have linked Mutual funds with Aadhaar or not. This can be quite confusing and you may be wondering whether your mutual fund folios have been successfully linked to Aadhaar or not. Is there any way to know your Mutual Funds – Aadhaar linking status online? Do you need to call each and every AMC to know the linking status, or is there any other simple way to know Aadhaar linking status? Yes, you may call the AMCs to know the linking status, but this can be a time-consuming option. However, the RTAs like CAMS and Karvy have now come up with online provisions to know Aadhaar number – Mutual Fund folios linking status online. 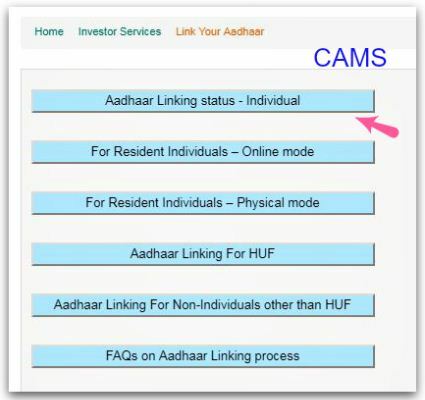 How to check Mutual Funds – Aadhaar Linking Status online for CAMS serviced Mutual Fund Schemes? If you have made investments in the MF Schemes offered by the above AMCs, you would have linked your Aadhaar number to MF Folios through respective AMCs or through CAMS. Click on ‘Aadhaar linking status – Individual’ option. You need to provide your PAN number and click on ‘Submit’ button. If your Aadhaar number is linked to CAMS serviced Mutual Fund Companies, then you can view the status message as “Aadhaar available for given PAN”. In case, you have not yet submitted your Aadhaar (or) Aadhaar is not linked to CAMS serviced Mutual Fund Companies, then you will see the status as “Aadhaar to be provided for the given PAN”. How to check Mutual Funds – Aadhaar Number Linking Status online for Karvy serviced Mutual Fund Schemes? Kindly visit Karvy’s Aadhaar Linking status check online facility. Click on the respective options as shown in the above image. You need to provide your PAN number and then click on ‘generate OTP’ button. You will receive an OTP on your registered mobile number and email (linked to MF Folios with Karvy). Enter OTP in the relevant field and click on ‘Validate OTP’ button. If your Mutual fund folios have already been linked to Aadhaar, you will get the message as “Status : Aadhaar Seeding Successful”, else the message “Aadhaar not registered” will be displayed on the screen. Besides CAMS and Karvy, the other RTAs are Franklin and Sundaram. As of now, these RT Agents are yet to provide online Aadhaar linking status check facilities. If you have invested in their MF schemes, you may have to check with their customer care centers to know the linking status. How to link Aadhaar number to Mutual Fund Investments online? How to link Aadhaar number to LIC Policies online? How to check / verify if your Aadhaar number is active or not? How to link Aadhaar Number with PAN in three simple steps? Dear Srikanth,Recently we are listening in media a lot of frauds in Banks in India.Even your money is not safe in your savings account in the bank.A hacker can withdraw all your life savings in one go or a thief can withdraw your money from your account with help of a corrupt bank man.It was a news recently in a news paper.Another side.Peoples are investing in mutual funds in billions every year.If we forget negative returns,how safe is your money in debt funds or equity funds.Can a fraudulent person withdraw your money from your mutual fund.I hope you understand my question.I will like you to write a an article comparing both methods of saving money with stress on safety.I think you are the most appropriate person to analyse. However, a fraudster may find it easier to withdraw funds from a bank than to redeem mutual fund units of an investor and then get those funds transferred to his account (which is a very difficult task). Can we have an article related to the best equity funds to invest in this year 2018? Due to the SEBI recategorization norms, all fund houses have been restructuring their schemes now. We can expect a lot of changes..so let’s wait for some more time..
thanks for sharing this info. very useful. how can we check for Sundaram? Dear Vinay ..I believe that Sundaram is yet to provide a dedicated online ‘linking check’ facility. Please tell me, a mf purchased on my daughter’s name age 12 yrs, whose aadhar to be linked? Mine or daughter’s? She doesn’t have PAN.also where to link UTI child career fund ? If you are investing in your minor kid’s name, then your Aadhaar should be linked to the respective MF folio. Aadhaar information of the major need to be furnished when Minor attains Majority status for effecting suitable changes.. In CAMS, Aadhaar to be provided and Karvy shows “Aadhaar seeding Successful” ? Which one to be followed? Shall I considered that Aadhaar linking is completed for all MF? Similarly, I verified it in my direct a/c and it shows verified. CAMS & Karvy provide service to different set of mutual fund companies as highlighted in above article. If you have invested in any of the schemes serviced by CAMS then you need to submit your Aadhaar to CAMS or respective AMCs also. Please let me know ELSS mutual funds of this year. As per SEBI’s new norms, all fund house have been re-structuring their schemes, hence I am waiting to publish articles on ‘best equity funds’ and ‘best elss funds’. Will try to publish them ASAP. 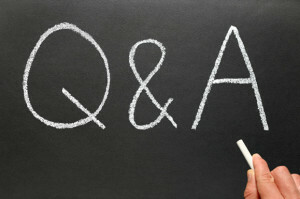 My suggestions would be : Franklin Taxshield / Birla Tax relief 96 / Axis LTE / DSP tax saver.